On sale beginning January 3rd at Food City*, the Ripley's Annual Ultimate Fun Pass. Get access to ALL 8 Ripley's attraction in Gatlinburg, TN for the lowest price anywhere when you purchase your season passes at Food City! Season passes for adults, ages 12 and up, are only $99.99, regularly $145.26, and children's passes are only $54.99 each, regularly $72.63. What an incredible deal for an entire year of Family Fun. 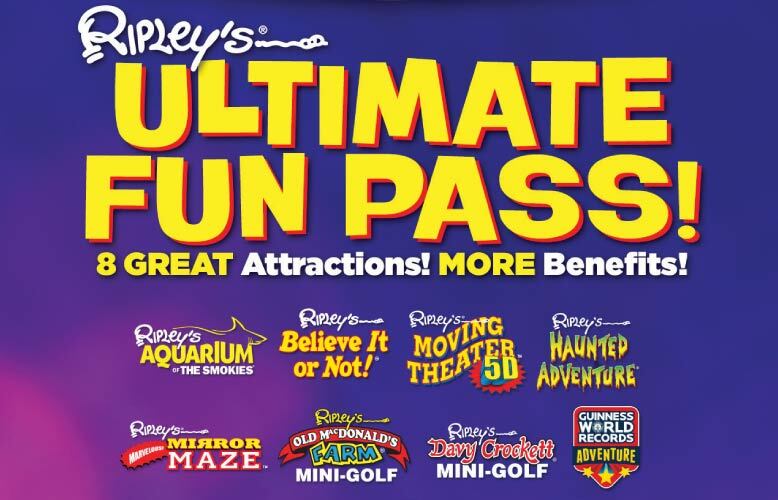 Your season pass includes unlimited admissions to; Ripley's Aquarium of the Smokies, Ripley's Haunted Adventure, Ripley's 5D Moving Theater, Ripley's Believe It or Not, Ripley's Marvelous Mirror Maze, Ripley's Davy Crockett Mini-Golf, Ripley's Guinness World Records Adventure, and Ripley's Old MacDonald's Farm Mini-Golf. You also save on admission, merchandise and food at all Ripley's Tennessee and Myrtle Beach attractions. Save on Splash with the Stingrays and Birthday Parties at Ripley’s Aquarium of Smokies. Additional benefits include savings on Admission to Dollywood, Dollywood's Splash Country, Zoo Knoxville and more! To learn more about Ripley's Attractions in Gatlinburg, please visit their website. *Pricing includes sales tax. Not available for sale in our Chattanooga and GA area locations.